Pittsburgh Steelers Fanatic: On This Date . 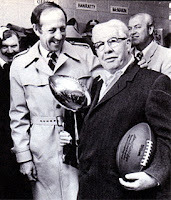 . .
January 12, 1975, the Pittsburgh Steelers won their first Super Bowl, Super Bowl IX, by defeating the Minnesota Vikings 16-6 at Tulane Stadium in New Orleans, Louisiana. For information about the game itself, click here for Wikipedia; and for a feature article about the champions and their lovable, long-suffering owner click here.